Amazon made Voice Lessons To Go, Amazon's Choice! 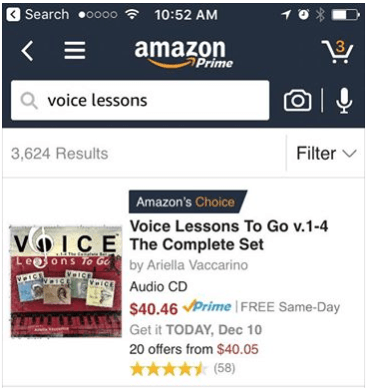 As I was shopping for presents for family this morning, I put the words Voice Lessons in the search bar on Amazon and Voice Lessons To Go (the box set) came up as Amazon's Choice out of 3,624 results. I was stunned. That is amazing. I wanted to thank you all for purchasing my Voice Lessons To Go products. I run Voice Lessons To Go out of my home, creating, recording,editing, shipping everything, and the fact that it can have as much success as it does without a big company pushing my products behind me is mind blowing. I know there is endless room for Voice Lessons To Go to grow and am excited about the possibilities. Thank you for all your support, your recommendations, and your connections. Please keep Voice Lessons To Go in mind for your holiday gift giving. Also, if there are any stores, or professional contacts you think would be the right fit that you have connections to please pass our name name along! They also have a great deal posted which I will beat especially for my blog and newsletter readers. Box set for $39- tax included, free shipping in the U.S. This deal will be good through December 18th, 2016. Click the link here to purchase and put the word "Choice" as your code at checkout to get the discount.